Whispers in the Loggia: "This Is An American Issue": On HHS Mandate, Bishops "Strongly Unified and Intensely Focused"
"This Is An American Issue": On HHS Mandate, Bishops "Strongly Unified and Intensely Focused"
As foreseen earlier today, an extensive statement on the Stateside church's next steps in its fight against the Obama administration's contraceptive mandate has freshly emerged at the close of this week's Washington meeting of the Administrative Committee of the US bishops. Numbering about 30 prelates, the Administrative group -- led by the conference president, Cardinal Timothy Dolan of New York -- is comprised of body's executive officers and the chairs of its 16 standing committees in addition to regional representatives. 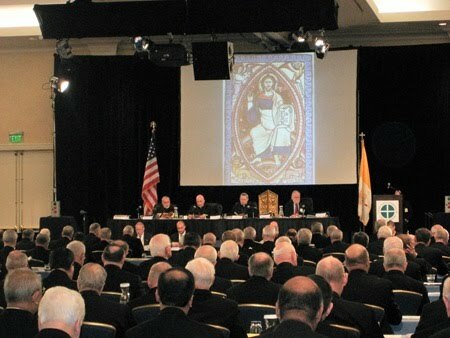 It is the most authoritative assembly of the bishops outside of their plenary meetings, the next of which takes place in Atlanta in mid-June. Here below, the Admin's message in full -- emphases original. their own faith. We are deeply concerned about this new definition of who we are as people of faith and what constitutes our ministry. The introduction of this unprecedented defining of faith communities and their ministries has precipitated this struggle for religious freedom. Government has no place defining religion and religious ministry. HHS thus creates and enforces a new distinction—alien both to our Catholic tradition and to federal law—between our houses of worship and our great ministries of service to our neighbors, namely, the poor, the homeless, the sick, the students in our schools and universities, and others in need, of any faith community or none. Cf. Deus Caritas Est, Nos. 20-33. We are commanded both to love and to serve the Lord; laws that protect our freedom to comply with one of these commands but not the other are nothing to celebrate. Indeed, they must be rejected, for they create a “second class” of citizenship within our religious community. And if this definition is allowed to stand, it will spread throughout federal law, weakening its healthy tradition of generous respect for religious freedom and diversity. All—not just some—of our religious institutions share equally in the very same God-given, legally-recognized right not “to be forced to act in a manner contrary to [their] own beliefs.” Dignitatis Humanae, No. 2.
have led the fight against such government incursions on conscience, particularly in the area of health care. Far from making us waver in this longstanding commitment, the unprecedented magnitude of this latest threat has only strengthened our resolve to maintain that consistent view.